Welcome to the Vainglory Hero Spotlight and today we will be looking at Solaris , the Herald of Unyielding Valiance who leads the crusade against the enemy. Solaris was one of the earlier champions I designed and therefore, has a special place in my heart. However, the valiant Herald has not stood the test of time and is in dire need of a rework. The problems with Solaris was that his passive and abilities didn’t feel that special or engaging. Solaris’s old passive also didn’t quite fit into his playstyle. Also, there were problems with Solaris’s lore as a Herald that had given me headaches ever since. As an all-powerful divine angel who was extremely biased and shortsighted. Solaris was essentially a bland overbearing angel of order archetype that was quite dull. He was also massively too powerful in the lore compared to in-game going into almost divine proportions. 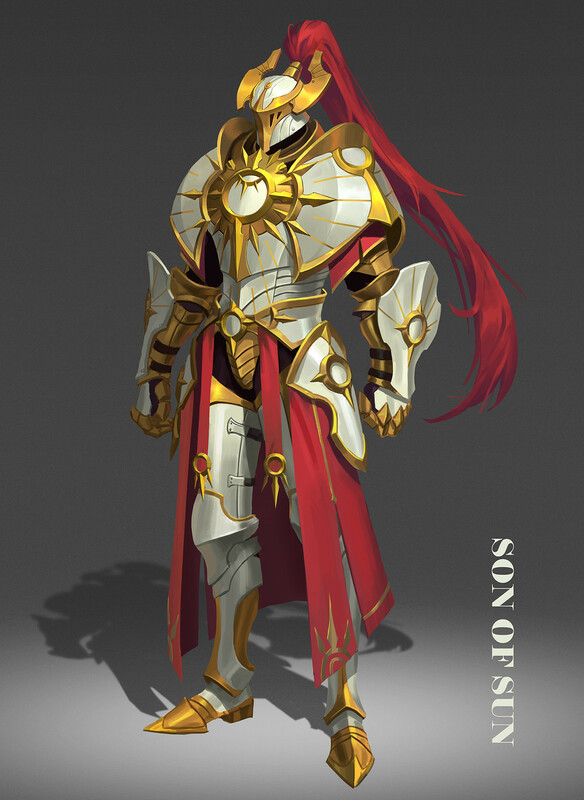 This rework will hopefully bring Solaris up to par with other warriors and make it more engaging to play with while also toning down his divinity and power level lorewise. Little is known about the Solaris’s origins aside from stories and legends. One tale tells of a valiant commander leading his army into battle against the malignant Churn. He pushed on despite the odds even when other commanders had ordered a retreat against elemental destruction. In the course of the battle, he slew countless churn beasts with the fury of the radiant sun. It was said that even the fluid from the slain Churn monsters on his blade was steaming. While wisps of emerald fumes choked the landscape, he seemed to be the sole light among his weary unit of soldiers illuminating the way. He was eventually grievously wounded from the seemingly endless tides of the Churn, yet refused treatment and pushed on. His unyielding spirit and courage inspired his man and women to join him and resolve to push on and eventually, the Churn was pushed back and the crisis averted. With his final sword stroke, however, the commander also drew his last breath. His men found his body slumped against the flag standard and tearfully, buried him beneath it. The next morning the sun’s brilliance illuminated the carnage and destruction of the battlefield, Yet the soldiers were surprised to awaken to plants germinating from the earth and flowers blossoming. How could this be possible? the toxic bodily fluids of the Churnbeasts should have rendered the very earth itself corrupted and unable to sustain life, yet what had been a muddy twisted wasteland was now a green meadow. Confused the soldiers turned their attention to the tattered Flag Standard where their fallen commander now rested under. The mud-drenched tattered flag was now glowing as bright as the rising sun as it flapped in the wind. The glow was too much that many averted their eyes as the Flag’s luminosity increased in intensity, then it ceased. Some of the soldiers later on in their lives claimed that they thought they could see an outline of their commander in that radiance standing next to the flag before vanishing. The commander’s true name was never discovered but the name Solaris was given because of the sun’s unusual brilliance that morning. Whether or not the story and legends that followed afterward throughout the ages were truth or fiction is up for debate, with the recent resurgence of the Churn and the Nether, it’s not uncommon for soldiers going into battle to pray to Solaris to aid them in battle. During some battles, men and women on either warring side have also reported sightings of an ornate humanoid clad in golden armor that radiated with the brilliance of a rising sun. Others reported armies cut down by swords of intense luminosity after a flash of white light. Still more are tales of tyrannical empires that threatened peaceful countries unable to fight as their troops dropped their weapons in agony due to a searing supernatural heat that burned their palms. Could the once human commander still be watching over soldiers everywhere as he once did eons ago? On the Rise, Solaris is a durable warrior who leads the charge against the enemy, wearing down his enemies. Those who challenge the Herald of Valiance will be confronted by his splendor, breaking their will to fight. When Solaris strikes an enemy with his abilities and follows up with a basic attack within 1.5 seconds of each other, he will gain damage reduction based on enemies within a 6-meter radius. Can only proc once per ability. Damage reduction = 10% (+ 10% per hero). Lasts 0.9 seconds. Solaris tosses a javelin in the targeted direction dealing damage to everything along its path. Upon reaching the end of its range, the javelin transforms into a Flag Standard that lasts for 5 seconds. If Estandar Solis damages at least ONE enemy; Solaris can reactivate the ability within 1.2 seconds to dash towards the Flag Standard dealing damage to all enemies 3 meters around his destination. OVERDRIVE: Solaris’s Flag Standard lasts 10 seconds. Solaris releases a pulse of light that damages and BLINDS all enemies in a 5-meter area around him temporarily reducing their vision radius to 3 meters. If this ability damages at least one enemy, his next 3 basic attacks within 6s deal bonus crystal damage. If Solaris casts Inquisition atop his Flag Standard, his empowered basic attacks will grant him a burst of movement speed for 1.8s. OVERDRIVE: Basic attacks reduce the cooldown of Estandar Solis by 1 second. Solaris forms a 7-meter circular array of slender diamond-shaped photon blades around him. Enemies that try to pass through the perimeter will take damage. After a short duration, the blades return to Solaris dealing damage to all enemies they pass through. If Solaris casts Dominion Resplandar atop of his Flag Standard the blades will SUPPRESS enemies who pass through which stacks with multiple blades strike. SUPPRESSED enemy heroes CANNOT use abilities or basic attacks but can still move and use items. Each rank in this ability increases the number of blades in the array. THANK YOU FOR READING THE SOLARIS HERO REWORK, IF YOU WANT TO FIND OUT MORE ABOUT THE HERALD OF VALIANCE PLEASE COMMENTATE DOWN BELOW TO SUPPORT THE AUTHOR. FOR INFO ON THE FALLEN HERALD OF JUDGEMENT FOLLOW LINKS BELOW. In my opinion this is your best overall hero design ever. It’s clean, has a unique ability set and playstyle, and generally works really well. I could see this hero played in lots of different positions, and different builds, which is always a good thing. My one and only issue, is the blink when his B is empowered. Firstly, it needs a max range otherwise he could follow enemies potentially across the map. Secondly I don’t think a warrior frontline should have access to this kind of mobility. Assassins sometimes get small blinks on long cooldowns. This hero litterally has 3 blink back to back which would just make him obnoxious. It also does not really make a lot of sense. Presumably you have just A, A reactivated, then B into a group of enemies. What use is blinking in this scenario? especially when you only have 1.6 seconds max to use it. It only helps if an enemy dashed away very quickly, otherwise it would just make auto attacking really weird as you dashed tiny tiny distances. Pretty much any other basic attack empowerment would make more sense. Add slows to the 3 attacks, maybe they grant increased move speed? but blinks? why? What would you propose I replace the blink mechanic with? I don’t want to make the effect a slow as that’s too generic. Giving him any other form of CC will overload his kit.